One of the best ways to save space and make your bathroom look larger is with a product that you can install right in a corner like this one. Renovator’s Supply designed this one to measure just 18.5 inches across the top, which lets it take up even less space when tucked inside a corner. The manufacturer also added a finish to the china that is resistant to both stains and scratches. 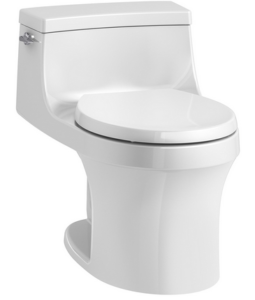 This corner model is also one of the dual flush models that has one button for using a low or an ultra low setting. The low setting uses 1.6 gallons and is suitable for more solid waste. Its ultra low setting uses only 0.8 gallons per flush but is strong enough for any type of liquid waste. Though its name makes it sound like something from an action flick, the T-0001 is actually a strong product that is suitable for any home or bathroom. It has a modern design and uses just one piece that you can install easily, though you may have some trouble reaching the mounting flanges in the base. The trapaway in the base has a glaze coating that helps debris move down smoother to keep that debris from causing clogs. Flush buttons on the side have clear number one and two markings that tell you which ones are suitable for solid and liquid waste types. Each button produces a different amount of water to work on that waste. Make your bathroom look bigger than you ever thought possible with this model that you can install in any corner and connect to your plumbing system. The smaller size of the tank will not interfere with your flushing, but this smaller design helps the toilet take up limited floor space. You need a 12-inch rough-in for installation, but your plumber can easily connect it to the water pipe. Built into the base is a trapway that is slightly larger in size to allow more waste and debris to move down the pipe without clogging the base. This model is resistant to scratches caused by paper and other things that you flush. Its finish is also resistant to stains. An affordable option for those who already have a tank they can use is this Cadet model from American Standard, which comes with just the bowl and not a seat or tank. The EverClean surface on this product is resistant to the microbes living in your bathroom and inhibit the growth of germs and bacteria. This surface coating can also prevent mold and mildew. Sitting slightly higher than average off the floor, this model is more comfortable for taller people to use. It has the same larger trapway found on other American Standard products that lets more go down the trap without objects and waste causing clogs or other problems. Save space and water with the San Souci, which has a round front that takes up much less space than an elongated front would. A trip lever on the side functions as the handle that lets you flush the toilet, and it uses just 1.28 gallons per flush to lower your water bill. It also has a lower profile that you can hide behind a sink or cabinet. Despite being a smaller model, you’ll still get all the space that you need for sitting. The back of the base is slightly open to further reduce the footprint and to give you space for storing things around the base or using a shelf above.